Jet Win Industries Inc. was founded in Taiwan in 1975 with registered brand as JODEN and specialized in producing elegant high quality Kitchen & Bathroom products. In 1992, Jet Win set up Joden (Jiangmen) Inc. in Guangdong, China. Supported by the most advanced quality control equipment and strict quality management system, JODEN has been certified ISO9001、ISO14000、UPC、WaterMark、TISI, etc. and has kept its leading position in the industry. 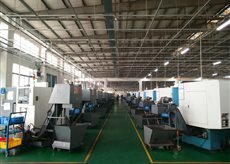 To extend production capacity and the best service, in 1999, JODEN set up new plant of 32,000 m2 , where the most advanced technology and equipment such as low pressure casting, gravity casting, spectrometer, 3D measuring machine and auto plating line are applied. In Jan. 2009 Joden invested USD9 million to set up Joden (China) Inc. as marketing management center in Guangzhou to handle domestic sales channel throughout the nation. To perfect service to customers, in Aug. 2009 Joden brought in advanced PVD facility to offer excellent surface finishing over brass products; in Nov. 2009 Joden established “The Kitchen & Bath Boutique Living Museum”; then, in Dec. 2009 a brand-new 6-floor workshop started to contribute to the production line of Joden. “Constantly improving the quality and achieving the best around the world” is the principle of JODEN. To offer the best service to our consumers and to do everything for the good of the community is our goal. Let our reputation help your reputation. We anticipate pleasure of your co-operation for a long-term pleasant and profitable working relationship. ²Bringing in the advanced automatic Iow pressure casting production line and marching a new milestone in production capacity. ²Overall upgrading production capacity and bringing more than a hundred advanced automated precise & reliable machining facilities. ²Joden certified as the national enterprise implementing new standard of GB18145-2014 for faucets. ² Obtaining the reelection of “Top Ten Famous Brands of Kitchen & Bathroom Products” and the honor of “National Quality Integrity Initiative Advanced Model Enterprise” from the China Quality Association. 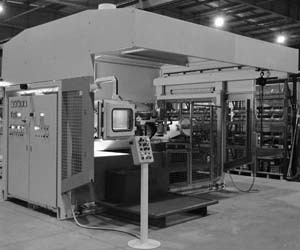 ² Introducing advanced PVD production line and technology. ² Through ISO14001 international environmental management system certification, JODEN actively supports green design concepts for kitchen & bathroom. ² JODEN (China) Co., Ltd. was established in Guangzhou for nationwide marketing and management of four offices located in Shanghai (East), Guangzhou (South), Chengdu (West) and Beijing (North). ² Won the “Top Ten Enterprises of Kitchen & Bathroom Products in China” and partnerships with numerous high-end household marts/malls. ² One of the Top Ten Influential Brands of Kitchen & Bathroom products in China was conferred. ² “Innovative Design Award - KAPOK PRIZE” was awarded. ² WaterMark certification was given. 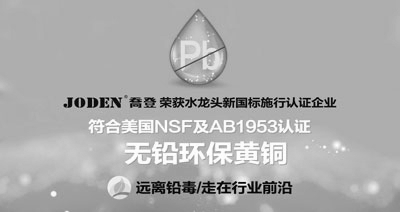 In 2006 “Stable Qualified Enterprise of Product Quality Inspection (1996-2006)” was awarded from China Quality Association, JODEN becomes a model of quality within the industry, so JODEN builds excellent quality brand image. In 2000 Certification of ISO9001 was awarded while JODEN actively advocated the motto as “Integrity-oriented, Quality first”. 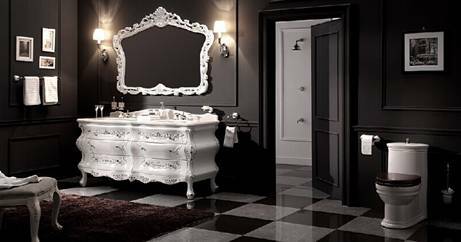 In 1998 JODEN took the lead in introducing the concept of “Integral bathroom” into China market. With faucets as the core of kitchen & bathroom products, JODEN products swept domestic market and achieved a breakthrough in sales of US$16 mil. In 1992 Jet Win invested and set up a factory named JODEN Inc. in Jiangmen, Guangdong, China. In 1975 Jet Win Industries Inc. specializing in producing exquisite bathroom & kitchen products branded as “JODEN” was founded.